Helix pomatia - a crawling edible snail - enlarged approximately 6x, in ‘SOMSO-Plast’. The right total view shows the shell, while the left one shows the opened snail. 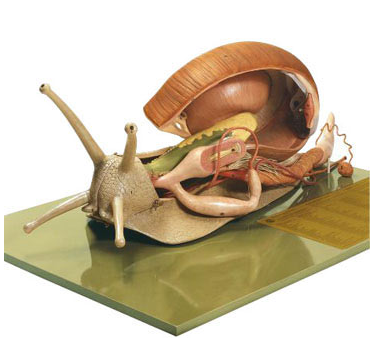 The lower portion of the shell as well as parts of the intestinal sac, the lungs and foot muscles are partly removed to show all important internal organs. The part lying between throat and small intestine of the intestinal canal can be removed. Therefore the cross genital apparatus can be seen completely. Separates into 4 parts. On a base. H28 cm, W68 cm, D45 cm, Wt 7.5 kg.